Long before I had my own home, I pondered the Pistol vs Shotgun vs Rifle for home defense quandary. Consider: It’s the middle of the night. You’re sound asleep until a noise wakes you. Perhaps it your watch dog barking, something breaking, or even a loved one screaming. You think there’s a bad guy in the house intending to do harm to you and your loved ones. Which would you reach for first? I’m going to examine the strengths and weaknesses of each, then end with a summery of what I think is the best option. I’ll also explain why (unfortunately) I don’t have the best option by my bedside… yet. Pistols are very convenient. They are small, lightweight, easily maneuvered, they have good capacity (excellent with extended mags), and fairly low recoil. Many people keep them next to the bed because of that. Pistols have two HUGE problems. Problem #1: Pistols are MUCH harder to shoot accurately than long guns. 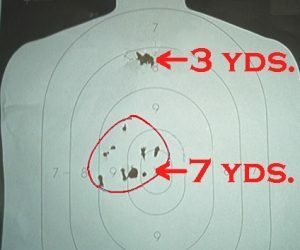 Novice rifle or shotgun shooters with about ten seconds of instruction can easily hit an 8.5×11 sheet of paper at ten yards practically every time. Being far smaller and lighter, they are way easier to pull off target than a rifle or shotgun. For those who practice a lot, it’s not much of an issue. But if you only get to the range occasionally, then under stress it will be an issue. If you’re a real shooter and have a lot of practice under your belt, then this applies much less. But newer and intermediate shooters should beware the effects of adrenaline on your accuracy. Just over 4 out of 5 shots missed. Even those who have training have trouble hitting with handguns under stress. And as I say all over this website, you can’t miss fast enough to win a gunfight. So Practice. Practice, practice practice. Problem #2: Pistols are FAR less powerful than rifles or shotguns. I think the biggest problem is this: Pistols don’t stop people well. They don’t have the mass or velocity to create a truly devastating (read: “fight stopping”) wound. You might not believe me, so I submit stories like this as proof: Bad guy not stopped by 14 rounds of .45 ACP Hollowpoint. And no, he didn’t have drugs or alcohol in his system. 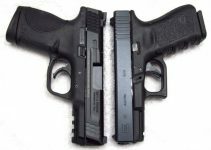 I explain why in my article on “stopping power” and terminal performance, but the simple truth is handguns don’t stop people well. That’s not to say a pistol can’t or won’t kill someone. However, there’s a very large difference between killing someone and stopping them. For example: if you put a pistol bullet through the heart, the odds of survival are almost non-existent. However, even with a destroyed heart, a person can still move, fight and attack for 6-10 seconds. 6-10 seconds might not seem like a lot, but in a fight it’s a lifetime. It’s enough time for the bad guy to shoot a whole magazine, do some serious stabbing damage, break bones, or cause permanent damage some other way. I want to stop them RIGHT NOW. However a single high center of mass round from a shotgun or rifle can stop people right now. With very few exceptions, handguns cartridges like the 9mm, 40 S&W, and .45 ACP can only poke holes. That’s it. Nothing else. That’s what the FBI says. After the Miami shootout in 1986, the FBI released a Report called “Handgun Wounding Factors and Effectiveness“. In it they detail how handguns wound bad guys. I can sum up what they say in one sentence. “Handguns only poke holes“. 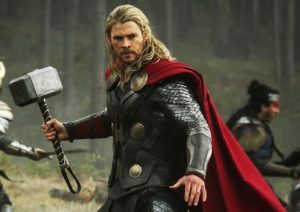 Hollywood makes it look like any gun hits like the hammer of Thor. Pistols only poke holes unless we’re talking about large and powerful magnums. Rifles and shotguns with high quality ammo are much more powerful. There is good news for pistol though. In the vast majority of civilian defensive gun uses, the criminal flees after the first hit with anything. Doesn’t matter if it’s 22LR or 500 S&W Magnum, they tend to run once they’ve been hit. That’s REALLY great news for the good guys because we all carry pistols for self defense. But the bad guys don’t always flee after being hit once. If they keep attacking you need to force them to stop by causing damage. Pistols have trouble causing enough damage to stop people. Handguns are harder to shoot accurately than pistols, especially under stress. Personally, I think Pistols are the WORST possible option. It’s also unfortunately what I currently have on my nightstand. (more on why later) That said, a pistol is FAR better than nothing. There are a LOT of people who think the pistol vs shotgun vs rifle debate begins and ends with a shotgun. The reasons usually cited are the incredible “stopping power” and the “fact” that you don’t have to really aim. “just point in the general direction and pull the trigger” is the usual saying. It’s true that shotguns are very slightly more forgiving with shot placement than rifles or pistols. But the “fact” that you just need to point it in the general direction is completely wrong. You DO need to aim a shotgun. The Box O’ Truth did a great test on home defense shotgun patterns. If you look at the targets, none of them spread very wide at ten yards. Certainly not wide enough to “just point in the general direction and pull the trigger“. For home defense, 10 yards is a long way. Possibly a long hallway or great room could be that long, but half that distance is more likely. But lets say ten yards for the sake of argument. 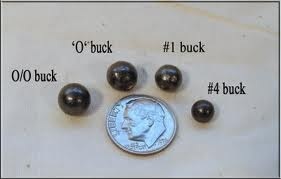 As a quick guesstimate, the commonly used 00 Buckshot usually spreads around 1 inch per yard. It’s worth noting that higher quality defensive shells actually spread LESS than 1 inch per yard. 1 inch per yard is only ten inches at ten yards. At the far more likely distance of 5 yards, it’s only 5 inches. That’s certainly a wider margin of error than a Pistol or rifle, but You STILL need to aim. I’ve probably said this in every article on this website: You can’t miss fast enough to win a gunfight. Okay, I’ll get off the soap box now. The biggest advantage of a shotgun is it’s raw power. The most common self defense shotgun load is 00 Buck. 00 Buck consists of 9 (sometimes 12) .330″ diameter round lead pellets. They weigh roughly 60 grains each and are launched at around 1200 feet per second. That’s comparable to getting hit by 9 (or 12) .32 ACP bullets at the same time. I have heard some people recommend bird shot for self defense, often to limit penetration. Let me say this clearly: Birdshot is a terrible choice for shotgun self defense ammo because it doesn’t penetrate deeply enough to cause a fight-stopping wound. The ideal is actually #1 Buckshot (with Federal’s LE1321B flight control being the gold standard) but 00 is very effective too. A good high center of mass hit with good shotgun ammo can end a fight instantly, which is ideal. The biggest downsides of a shotgun? Massive recoil, low capacity and long reload times. I realize the average self defense encounter happens at 7-10 feet and only last 3 rounds on average. However, 6 or 7 shells is not a lot of ammo if your encounter falls outside of average. 6 or 7 will *probably* be enough. However, I don’t prefer to rely on “probably” when my life or my loved one’s lives are on the line. But what if there’s more than one attacker? Under stress your accuracy won’t be the best. And what if they don’t stop attacking just because you have a shotgun? Shotguns not only have the lowest capacity, but they also take the longest to reload. Another big problem of a shotgun is recoil. Dr. Seuss references aside, recoil is a big problem for some of us. I have to fight hard not to flinch when shooting a 12 Gauge. Yes, even trap loads. If you don’t have that problem, that’s fine. If you do, that’s fine too. A good recoil pad can make a HUGE difference. The Pachmayr Decelerators, Kick-eez, and Limbsaver recoil pads can cut the felt recoil in half. However, you’re still talking 2-3 times the recoil of a 223/5.56 rifle. If you can take the recoil and live with the low capacity, it’s an effective weapon. To be blunt, I think this debate is silly (as long as we’re talking about reliable examples of both types). Would you use a pump action rifle in war or carry a pump action pistol for personal protection? Speed. Semi-autos are simply faster. If your first round misses, follow up shots are necessary. Under stress a miss is very possible, even likely. It removes an element of human error. 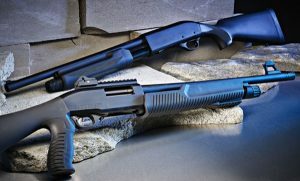 Short stroking a pump action shotgun is a possibility, and under stress it’s even more likely. One argument for the pump action is that it’s more reliable. That’s silly. There are semi-auto shotguns with “to hell and Back reliability“. Yes they cost more, but they do exist. With good ammo, any of those cartridges are just as effective as a shotgun. Some people will balk at me suggesting the 5.56 is just as devastating as a 12 Gauge shotgun. Those people should know the 5.56’s reputation for not stopping people is because of bad ammo. High quality ammo is a very different story. In the pistol vs shotgun vs rifle for home defense debate, I personally think a rifle is a great option . They are powerful, the recoil is low enough for fast accurate follow up shots, and being a long gun it’s easy to aim. Plus, a 30 round magazine means you won’t run empty. Now, I don’t think think you’ll get into a shootout in your home where you need 30 rounds of ammo. 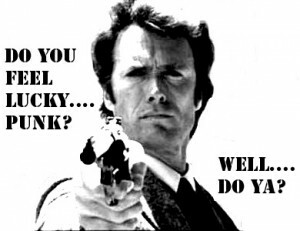 In fact, I highly doubt it because the average self defense gunfight only lasts ~3 shots. But by that logic, would you feel comfortable carrying a 3-shot pistol for concealed carry? Besides, there may not be just one bad guy (which we’ve already discussed) and more rounds will be better in that case. Rifles have roughly double the capacity of pistols and far better accuracy. Shotguns have 3-6 times more recoil than a rifle, but don’t create more damaging wounds. Plus, the rifle has 4-5 times more ammo. That’s why I’m biased toward rifles. I believe they are a more effective weapons than pistols or shotguns for most (though not all) combat situations. But I say that with two caveats. Home defense means close quarters, and a “regular” rifle (AR-15, AK-47 or similar weapon) just won’t cut it in my opinion. They are too long, too unwieldy, and almost impossible to use one-handed if it becomes necessary. 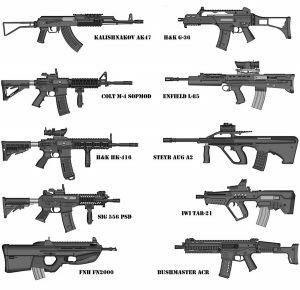 I favor rifles, but they have to be of the bullpup configuration. The shortness makes it more maneuverable, which is a huge bonus for close quarters. Plus it’s much more balanced, making one-handed manipulation easier. Noise is the second caveat, which I’ll cover in a minute. This is a hotly contested topic. conventional wisdom says that rifle rounds will penetrate more than pistol or shotgun rounds. As is usually the case, “conventional wisdom” is wrong…. Whether a pistol, shotgun or rifle penetrates further isn’t the issue. It’s how deadly the bullet is AFTER it penetrates. Q. Isn’t 5.56 too dangerous to use indoors? Shouldn’t I use a pistol or shotgun instead? Virtually any kind of ammo, with the exception of light bird shot, will easily penetrate typical wall construction (two layers of wall-board separated by 3 to 4 inches of space). Testing has shown, however, that after penetrating a typical interior wall, a 5.56mm projectile will have less wounding potential than most common handgun or buckshot loads. This is true because the low mass of the bullet sheds velocity quickly, and velocity is its key wounding component. This doesn’t mean that 5.56mm ammo isn’t still potentially deadly, but that the severity of an injury is likely to be less from a 5.56mm bullet than from a 9mm, .40, .45, or #00 buckshot round. What is important is not the degree to which these rounds penetrate, but their “ex post lethality” or their lethality AFTER encountering wallboard or other cover/concealment. The difference is so significant that the FBI and other ballistic experts recommend that law enforcement transition to handguns to “dig suspects out” of cover because of the superior penetration and wounding ability of handgun rounds over 5.56 or .223. This, along with the increasing number of lawsuits from “friendly fire” submachine gun victims and 5.56mm’s ability to penetrate ballistic vests, are some of the reasons that many SWAT teams are transitioning away from the 9mm MP5 and selecting 5.56mm carbines instead. This is understandable given the longer barrel length and therefore higher velocity and consequently higher penetration of handgun rounds in submachine guns. If our experience on the forums are accurate, most shot gunners and submachine gun fans receive this news poorly. It does seem counterintuitive since 5.56mm is a “high powered round.” All we can say to this is that the FBI FTU fired hundreds of rounds through carefully constructed wall sections and then into gel. Ignore these results at your own peril. So there you have it. The FBI’s official position on pistol vs shotgun vs rifle over-penetration is that 5.56 rifles are less dangerous than pistols or shotguns after penetrating walls. However, that only applies to 5.56 rifles. Other cartridges with similar characteristics (5.45×39) *might* achieve similar results. However, larger/heavier bullets like those in the 7.62×39, .300 blackout, 6.5 Grendel, 6.8 SPC, etc will likely be more lethal than pistols or shotguns because of the increased mass and momentum. So if you’re going to use a rifle for home defense, I HIGHLY recommend you stick with with 5.56/223. Personally, I would probably use Hornady’s 75gr TAP FPD, but that’s just one of many excellent options. You can find a list of them in the Best Choices for Self Defense Ammo on ar15.com. I would select a non-barrier load, because barrier loads are specifically designed to be more lethal after penetrating barriers like walls. 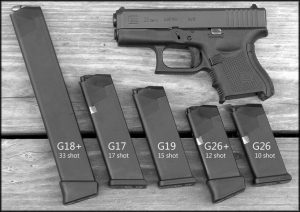 Pistols vs Shotguns vs Rifles – The Noise Issue. Regardless of which one you use, noise if a HUGE problem. Anyone who’s ever fired a gun at an indoor range can attest to this. We’re talking permanent hearing damage from shooting even one round without ear protection. And unfortunately, Rifles are the loudest. Not that shotguns and pistols aren’t loud. But they’re not as loud as rifles. On average, a centerfire pistol or shotgun measures around 160 decibels in common loads and barrel lengths. A 5.56 Rifle measures around 165 decibels, again with common loads in common barrel lengths. 5 decibels might not seem like a lot, but remember that decibels are weird. Every 10 decibels doubles the amount of sound you hear. So the 5 point decibel increase from pistols/shotguns to rifles is actually around ~50% more noise. The biggest problem with rifles is the absolutely deafening, earsplitting noise they make when fired indoors. I got those numbers from Silencertalk’s suppressor test results, except the shotgun which I googled. Speaking of suppressors (notice the smooth transition there?) There is a way to greatly reduce the noise generated by firearms. A good suppressor greatly reduces the noise of a rifle or pistol, and recently shotguns too. A good rifle suppressor will add less than a pound of weight and only 6-8 inches to your rifle’s length. Pistol suppressors about the same size, but lighter. The only shotgun suppressor I know of (SilencerCo’s Salvo 12) weighs more than 2 pounds and is a whole foot in length. Suppressors also reduce recoil by 20% – 30% in one person’s test. In a 5.56 rifle or pistol, it’s not a big deal because they don’t start with much recoil. The shotgun could benefit greatly. However, screwing an additional 12″ inches onto a 38″ shotgun (870 with 18″ barrel) means you’re using a weapon over four feet long. Not exactly the weapon I’d choose to clear a room. However, screw a 6-8 inch suppressor on a bullpup like the IWI TAVOR, and it’s only 32-34 inches long. around the length of an M4 with the stock extended. I won’t bother hiding it: I simply LOVE bullup rifles for this reason. They are so short compared to the traditional rifle arrangement. And I love rifles for the high power, low recoil, and excellent capacity. Pistols have the best maneuverability, good magazine capacity, and can be suppressed. However, they are the worst people stoppers and are the hardest to aim under stress. Shotguns have excellent power, and are (very) slightly more forgiving with shot placement. 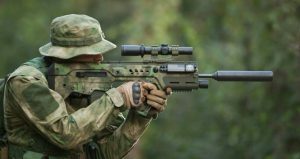 However, they have the highest recoil, lowest magazine capacity, are the slowest to reload, and are very limited in both bullpup and suppressor options. Rifles are very accurate, have excellent power and the least problem with over-penetration (assuming proper ammo). They have the highest magazine capacity, extremely mild recoil, are easy to suppress, and there are several bullpup options. The downside? Good bullpups are a bit expensive, and rifles are extremely loud when un-suppressed. Other than that, I truly can’t think of any. My Opinion? (if it wasn’t obvious by now). I think a Suppressed .223/5.56 bullpup rifle with proper bullet selection is an ideal home defense weapon. If you can’t afford that (rather expensive) combination or suppressors are illegal in your state, I’m conflicted on a second choice. An un-suppressed rifle is insanely loud, though possibly the best choice. A shotgun has the power needed to end a fight if you can take the recoil and accept the low capacity. Plus bullpup shotguns do exist. Pistols are probably the worst option, but FAR better than nothing. Unfortunately, I can’t afford a decent bullpup right now and suppressors are illegal in my state. I don’t do shotguns well at all, so I don’t currently own one. I also live in a low-crime area, so I only have a pistol by my bed. That’s my opinion on the pistol vs shotgun vs rifle for home defense debate. Make an informed decision, keep your powder dry, and make sure you practice with whatever you pick. I don’t normally leave comments but one downside of handguns as a home defense selection is that more and more home invasions are committed by people wearing body armor. Even if you are lucky enough(a reference to the NYPD statistic of 18% hits in actual shootouts) to hit them center mass, the body armor will likely enable them to stay in the fight. If they have committed a home invasion and are wearing body armor, make no mistake about it, they came expecting a fight and are likely used to employing violence of action which is usually a determining factor in who wins a fight. Absolutely a good point! Another point to make is to train with WHATEVER weapon you choose…IN your home. Get used to safe firing vectors (meaning, not towards your kid’s bed in their bedroom), be familiar with obstructions and know the choke points where you’re most likely to get excellent shots off. All of that may go to hell if you have to defend your home, but at least you’ll have the knowledge to possibly use. Better than not having it at all. Another thing (tying back to the initial comment)…is to put at least your initial round into the pelvic area. 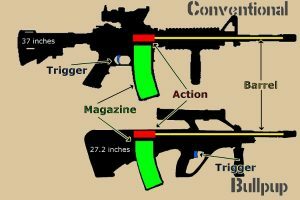 This will almost invariably eliminate mobility, is a safer shot vector (less chance of hitting a child, or neighbor if your round penetrates far enough), along with breaking any immediate intent to do harm to someone else as self preservation takes over. In addition, most people don’t wear body armor over their lower bodies. You can follow up much more safely after they fall. 2. What are the chances that you'll be faced with such a situation over your entire life? Sanely, I suspect the answers to each is "As close to zero as makes no odds"
That’s good to note that pistols have low recoil and low reload times. That means missing won’t incapacitate you for too long. Sometimes all you need is the threat of a weapon to stop a burglar anyways. As far as suppressors go, if the intruder(s) are unarmed having a suppressor is great. If they are armed, what’s the likelihood they will have suppressed weapons? I’m inclined to keeping some kind of hearing protection next to my home defense firearm. I’m looking for something that can on quickly, not cumbersome, does not have to be 100% effective. My primary home defense weapon is a Glock 19 with 2 33 round mags wearing a suppressor and a laser/flashlight. Small, Light, hearing safe, 66 rounds of ammo on tap. 1 round of 9mm is not super effective, But 10 should be, my AR15 in 300 blackout with subs is the fallback if needed. I would definitely not want to wear hearing protection in a home invasion scenario, what if someone else is in the house, out of your line of sight, behind you in another room.. I’d prefer to use all of my senses in this situation. Even if you lose hearing, what are the chances of this happening twice in your lifetime? Id rather lose hearing than my life or my family. If the shooting already had begun you wouldnt hear anything anyhow. You could choose electronic ear protection. Nice article. Every 10 decibels is a 10 fold increase in sound. It only takes 3 more decibels to double the loudness. From what I understand, 3 decibels would double the power requirement, but not the noise. It takes a 10 decibel increase to double the noise. You can find a better explanation here and I might add their table to the article at some point. A 20 gauge shotgun is 2X as powerful as a .44 magnum with #3 buck and has about half the felt recoil as a 12 gauge with comparable loads. It is a man stopper in every sense of the word. Keep some slugs in a side saddle and I’ll take that over a rifle for HD any day. What about 5.7? The round works by tumbling instead of just punching holes? In terms of the bullet weight and velocity, it’s close to a 22 Magnum rifle, only with better bullet selection. From what I understand, the design perimeters were controllable fully automatic with AP capability. It does that well. However, I have read it has issue actually stopping people. The first post in this thread over on 24 hour campfire forum lists a number of sources you can go to for more reading. Isn’t this what 300BLK was designed for? Subsonic, suppressed, short, rifle ballistics. Thoughts on AR9 (9mm PCC)? Thoughts on AR15 pistol brace with ~11″ barrel? 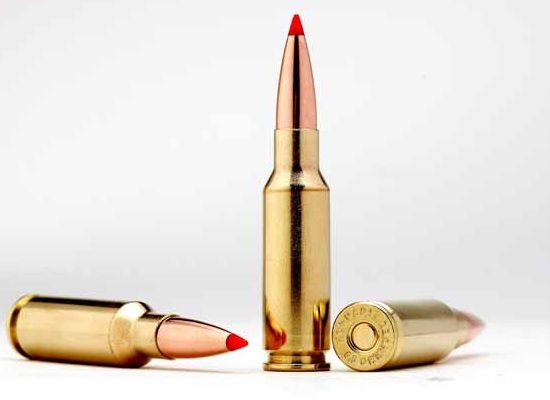 300 blackout supersonic loads are essentially a 7.62×39 ballistically and thus fall firmly in the rifle category. The subsonic loads are essentially a 45 ACP with improved penetration (~220gr @ <1000fps). Personally, I think its a "worst of both worlds" cartridge ballistically. A 16" barrel 9mm does change things with certain ammunition. 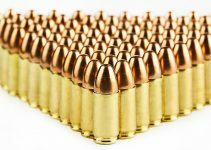 Light for caliber (~90gr and under) bullets can be pushed very fast and – if you choose a bullet that takes advantage of that – it could be effective. 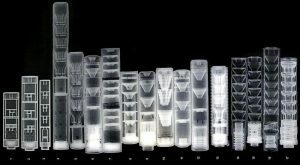 I’m thinking bullets like the Lehigh Xtreme Defender, the Polycase ARX and others with non-standard (i.e. non-expanding) wounding mechanisms. I plan to get a 9mm rifle one of these days and do some ballistics testing because I think (no data to support it) but I think it could be a very effective combination. I will be first time gun owner…. home defense and shtf purpose… will take classes and try to train but not an enthusiast. 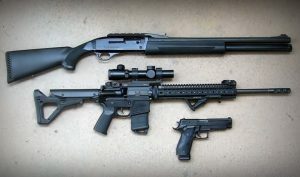 I was set on getting a Mossberg 500 20ga but am now leaning to a pistol caliber carbine or bullpub shotgun. I like the new Ruger PC Carbine, the CZScorpion pistol caliber carbine and the ISI Tavor 12….leaning to the Ruger. i would appreciate thoughts…….. would you recommend the Mossberg or the PCC? If PCC, which one would you recommend? A shotgun has high damage, but a lower rate of fire and lower magazine capacity. A PCC has a high rate of fire and high capacity, but low to moderate damage. (depending on what bullet you use. Check out the second paragraph of my comment just above for more info) It depends on what’s important to you. I *think* (personal opinion, no evidence) but I think a PCC with the right ammo could be a great option. However, a shotgun – especially a semi-auto shotgun – will work very well. I don’t like shotguns so I’d personally go with the a 16″ barreled 9mm PCC shooting Lehigh Xtreme Defenders. I’d go with a Mech-Tech CCU for my Glock, but that’s a personal preference thing. I think a pistol caliber carbine would be the best long gun inside a home. A 9mm carbine can give you the identical ballistics of a hot 357 without the loudness. Some professionals will agree that a good rifle, preferably an AR-15 with a 30 round mag. is the best. Just my opinion after 40 years of shooting is that a good pistol or revolver is better suited for home defense. Why? People are half asleep when someone kicks in their door at 2 a.m. with a gun or knife and intends upon doing harm if need be before leaving with whatever. You grab your rifle and carry it with one hand into your children’s room. You and your wife close the door and hope the intruder does not come your way. Do you have time to grab the gun with both hands and move through the house? A handgun will give you moving rights along with shooting rights at the same time. Long guns are cumbersome in close quarters. Just my opinion…. Agree on all points. My AR-15 is very light and I wouldn’t want to use it one-handed. A bullpup balances much better and is compact enough to close quarters in my opinion though, and could be used one-handed. every shooting distance will render the ideal kind of weapons, at one foot I will prefer a knife or a big hammer for justone attacker, as distance varies the kind of needed weapon changes. The kind of home alarm you have will increase the possibilities of choosing you scenario and the kind of weapon needed. Remember your body and mind (depending of your age and condition) are not a mechanical machine. After a sudden wake up your body and mind would possibly need some time to warming, find your weapon, locate your kids location, possibly locate your magazine and final react to the Thread, so your home alarm is more important than the weapon, you even may choice the sometimes best choice, gather your family and weapon and run and call 911. The best fight is the one that no takes place. I did not mention that your kids may be wandering around the house asking what happens and may get friendly fire. Speaking about pustol shot placement, I agree with you. A relation offre mine, member of the French GIGN (military swat team) recalls a fight. He blocked a bad guy in a stairase after a long chase ending after an 8 floor run up the stairs. They both shot all they had. He won the fight ONLY because he had a pistol. So when the bad guy’s wheelgun empited, the later feared my friend still had rounds in his gun. I must mention for the American readers the GIGN is one of the world’s most highly trained professionals, shooting hundreds of rounds a week. My friend which is one of the finest shot I ever met was stuned by how the stress offre both the intervention and the run had downgraded his shooting habilities. So imagine our performances, poor badly trained citizens, awaken in the middle of the night by armed robbers invading our home Android threatening our love ones… We’d better have the best possible equipment!!! That’s why I religiously follow what Chuck Taylor once told me in a training session in Switzerland: “The handgun only use is to fight your way tout that rifle you shouldn’t have left away fromage your grab…”. Pistol vs Shotgun vs Rifle for home defense. Pistol + Shotgun + AR15 (& soon to be + AR10). Glock 24 (40S&W), Mav88 SP (8rnd 12ga loaded with 00B), & a bare bones AR15 (5.56N). Glock 40 [10mm], KSG-T [PDX1 12], P90 [5.56N] (fullauto, Requires $200 stamp + FFL + SOT3). you can get the PS90 and all you need to do is get the $200 tax stamp. Really good article, Abe. Not too much “tactic-cool” and some very good reasoning. I did a tour with JSOC and got to see some of the world’s best shooters in action. Most of us are NOT the world’s best shooters, nor are we highly skilled in shooting in confined spaces, clearing houses, or ever going to face a home invasion (good Lord willing), with or without body armor as mentioned above. 1. Flash blindness. Whatever weapon you chose, make sure you test it out in low light and no light situations. Can’t tell you how many guys I know who hang all sorts of crap on their weapon and never think to actually try it out in similar light situations. You may find that you need to switch cartridges to avoid a huge muzzle flash, assuming you might want to shoot more than once and continue to see your target. 2. is your “weapon of choice” only for you? You may have this great plan to use your spiffy 5.56 carbine, yet you’re on the road for your job and that 2am home invasion is now faced by your significant other who doesn’t have a clue how to use your rifle, or you’ve got it customized for you. 3. Is your home defense set up built on a single point of failure? You’ve got this great home defense shotgun or AR set up in your bedroom. Yet you come back from the dinner and the movies at 11pm to find a burglar in your home…in your bedroom (where the goodies are, naturally)…so he’s where your weapon is. Now what? 4. Kids or no kids? Animals, or no animals? Anybody like house sitters or friends have keys/combo to your house? Alarm or no alarm? 5. Have you thought about your typical sight line in your house? I only have a couple of 10 yard sight lines in my house. Most are 7 or less. I think back to the ONLY time I’ve ever had to enter a house with intruders. My executive officer called from out of town (Christmas vacation) and told me a neighbor called to say an unknown car had been parked in his driveway all day. He asked me to go check on it. It was about 10pm and I’d had one beer. On the way out, my oldest daughter asked me if I was going to take my pistol with me. I told her no, as I’d had a beer. I grabbed a can of bear spray and headed over to the next cul-de-sac over where my XO lived. Sure enough, an unknown car was in the drive and a couple of lights were on in the basement. I put my hand on the glass front door, and noticed the solid interior door was open. I fully intended to leave and call 911, when a kid walked by the door. I opened it, stopped him and asked what he was doing there. From that point on, I could hear other voices down in the basement. I knew right then I wasn’t going downstairs. About 10 sec later, another kid came to the front door and came inside. I put both guys in front of me with the spray in my left hand and phone in the right. The homeowner then called me to tell me while he was calling me his wife had called our home town police. Great. Within a minute, a car pulls up with its headlights off. OK, has to be the unmarked car, as most people don’t drive down a cul de sac with headlights off. When nothing happened for about 20 sec, I turned on the outside light and told the kids to step out on the porch. I motioned to the car, and the policeman (waiting for back up) came on out. I also kept my hands in plain sight well away from my body. I did keep my phone and spray in them, however. I explained to him that the homeowner (and named him) had asked me to check on the property and that these two “gentlemen” were in the house as uninvited guests, and more were in the basement. He took their ID’s and they tried to explain that they were fellow football players from the oldest son’s team and he “invited them” into the house to play video games. In reality, what had happened was typical. Those kids and others had been home with the son many times, and watched him type the garage door remote entry code in many times. They knew he was gone on vacation and decided to use his house to play X-box and party. The son later said he did not invite anybody over, and did not give them the code. When the back up arrived, I stayed with the two boys (now id’ed so they were screwed even if they bolted) while the police checked the downstairs…of course the other young men were long gone out the basement sliding glass door. Once they verified that, I helped them clear the house, as I knew the layout, light switches and possible hiding places. All clear. and it was easier with me turning on the lights and them doing the back up. We secured the house, and I took the battery out of the remote entry and locked up the house. No beer cans were found, and didn’t look like anything in the bedrooms had been disturbed. Bunch of knuckleheads indeed were just playing X-box. (Probably only a matter of time until the booze showed up though). Bottom line here: Could have been a lot worse. Yeah, the kids weren’t supposed to be there. Can you imagine being the “guy with a gun” stepping out to face the police? Especially after having a beer? Or being the guy who “cleared the house and held 10 kids at gunpoint? As it was, I’m not sure the two I detained ever figured out I had a can of bear spray with the safety off ready to use. The situation worked out because I did a quick risk assessment and decided not to go further than one step into the house, and await the police. The homeowner was able to determine everybody who had been there and decided not to press charges after talking to the other parents. All members of the son’s football team. My point in relaying the above is that most of us “good guys with a gun” don’t need to go looking for trouble. Think long and hard about when to break out that gun. I’ve got lasers on most of my weapons, and any use indoors, you can bet I’ll try to get a laser spot on any potential bad guy to give him pause on where that shot will hit. Hopefully, it will result in no shots fired…or if there are shots, they will be accurate ones. If I suspect a break in, I’m going to either withdraw (if entering) or barricade and defend a bedroom (if in the house.) My last choice is to go wandering around the house, gun in hand looking to be surprised by a bad guy. That is what the police can do. I have insurance for the “stuff” in my life…and I’m getting too old to do hand-to-hand with some punk who breaks in, should it require it. My two cents. Yours may be different. I have a 9mm pistol and carbine for inside the home. The 16″ barrel gives 357 ballistics in a compact and quieter firearm. I leave the shotgun with tactical buckshot for outdoor use due to the size, loudness and better hitting ability up to 40 yards. I could also use a rifle outdoors as we live on a farm. First, I am not an expert, so if I make mistakes in discussing this topic, bear with me. A few of these have box or drum magazines that you can take out to replace fairly quickly. Some of the shotguns on these lists are semi-automatic or even automatic. And there are some powerful rounds that can be used, too, like the FRAG-12. There are also many shotguns with little recoil, such as the AA-12, and rounds that are “reduced recoil,” although I realize these are less powerful. There are other things I could say, but I don’t have time, so look these up and do some more research of your own, and you will find that a shotgun, which is a powerful weapon, can be very effective for home defense.